What If we have a special shape? 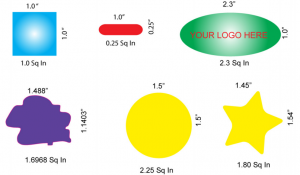 As special shapes may pose special problems please e‐mail an outline of any special shapes with your quote request. Can Labels be provided for doming? How are the labels provided (Sheets or Rolls)? Labels are shipped on sheets usually up to 12″ x 18. Do you do sample sheets? Yes, a 12″ x 18″ sample sheet is available (call for pricing). What is the smallest production run? The normal production run starts at 500 square inches (total area) (# labels x area of label). Why are the corners rounded? All corners have to be rounded so that the liquid will flow into the corners and not overflow the inside corners. Inside corners have to have a minimum radius of I/8″ (0.125″) more is preferred, while the outside corner has a minimum of 1/16″ radius again more is preferred. Jelly Labels are surprisingly affordable: you always get maximum impact for a minimal investment. Sizes, quantities etc. will determine your final costs. Tell us what your needs are and we’ll provide you with a free quotation. Will they work with my existing labels? In many cases you can add the unique Jelly Label “dome” to your existing labels. Certain limitations do apply based on size, materials etc. Contact our office to find out what will work for your unique situation. Yes, Jelly labels can be used in both indoor and outdoor applications. The polyurethane coating is both durable and protects from U.V. light so they will not crack or discolour over time (guaranteed for 3 to 5 years). All artwork is printed CMYK, and a concerted attempt is made to match the colour requested. Due to refraction, domes may also effect the colour. If a colour match is critical, then test runs should be done. We have permanent, hi‐tac and removable adhesives. Our standard white vinyl used has a fairly aggressive adhesive. Call if you have a special adhesive requirement. All effort is made to respond to quotes within a 24 hours period. Polyurethane is a tough but flexible coating that is UV resistant, self‐healing, scratch and scuff resistant. It can be used both indoors and outdoors and will not yellow or weather for three to five years.